Two months ago, I had the pleasure of visiting Botswana for the first time. Not the Okavango Delta or Chobe National Park (the big safari destinations in Botswana) but rather the capital of Botswana, Gaborone. I was very busy right before the trip, so I didn’t get to do much more than a perfunctory online search of what there was to do in Gaborone (which yielded very sketchy information), but I tried not to worry about it, sure that I’d figure it out once my trip began. On the appointed day, I hopped onto a Fastjet flight to Johannesburg (I would connect to Gaborone with Air Botswana), and off I went to discover what the capital of Botswana and the country at large had to offer. At O. R. Tambo International Airport (in Johannesburg), which I knew had its share of bookstores, I bought a Lonely Planet Botswana & Namibia travel guide and spent as much of my layover as possible, as well as the one-hour Air Botswana flight to Gaborone, reading up on what there was to do in the capital of Botswana and its environs. It was the first time I was buying a travel guide that covered two countries, which had me a little worried since the book was not particularly big. In hindsight, I understand why Lonely Planet chose to package the guide this way—Botswana and Namibia share similar ecosystems and it’s fairly easy to travel across the two countries—but although the travel guide had a lot of information about what to do around Botswana outside of Gaborone, think self-drives in the Kalahari and lots of information about Botswana’s many national parks, I couldn’t quite get a grasp of what there was to do in the capital of Botswana itself. Not to be defeated, I used as many resources as I could—the internet, asking locals, the Botswana Tourism Organisation (who were not at all helpful)—and somehow came up with enough interesting activities to fill my days while I was visiting Botswana. I have since spoken to some Batswana (that’s what the amazingly friendly and well-mannered people of Botswana are called) who I know online or who are spouses of friends (why didn’t I tap into that resource earlier?! ), and they seemed impressed with how much I did while I was in Gaborone. So that you don’t have to go through what I did, to get this information, I thought I’d share some of the things that I enjoyed doing while visiting the capital of Botswana in case you are ever travelling there and looking for things to do. I started my exploration of Gaborone at its most visited tourist destination: the Three Dikgosi (Chiefs) Monument. Located in Gaborone’s up and coming new central business district, the Three Dikgosi Monument was erected in 2005 on the occasion of the 39th anniversary of Botswana’s Independence. The monument commemorates three Setswana chiefs (including the great-grandfather of Botswana’s current president), who in 1895 traveled to Great Britain to request that the area now known as Botswana not fall under the rule of Cecil Rhodes. Were it not for these three chiefs, Botswana would likely not exist as a separate entity today but would probably instead be part of her neighbors Zimbabwe and/or South Africa. The Three Dikgosi Monument has at its core the statues of these three chiefs. To be honest, I was visiting the monument “just because” but didn’t expect it to be very exciting. Boy, was I wrong! What I thought would be a quick 15-minute visit to see statues, and maybe read a plaque or two, turned out to be an exciting hour-long excursion where I got a great overview of Botswana’s history, people, and culture. Truth be told, I knew very little about Botswana before I got there. Yes, I knew that Botswana was a relatively rich African country because of its huge diamond deposits—Botswana is the biggest producer of diamonds in the world by value—and I knew a big part of Botswana was covered by the Kalahari desert (or the Kgalagadi as it is known in Setswana). I knew a bit about the song and dance of Botswana because that’s something that is often performed at weddings in Dar es Salaam where I live, but I knew next to nothing about food from Botswana. Frankly, I had just never given it much thought. 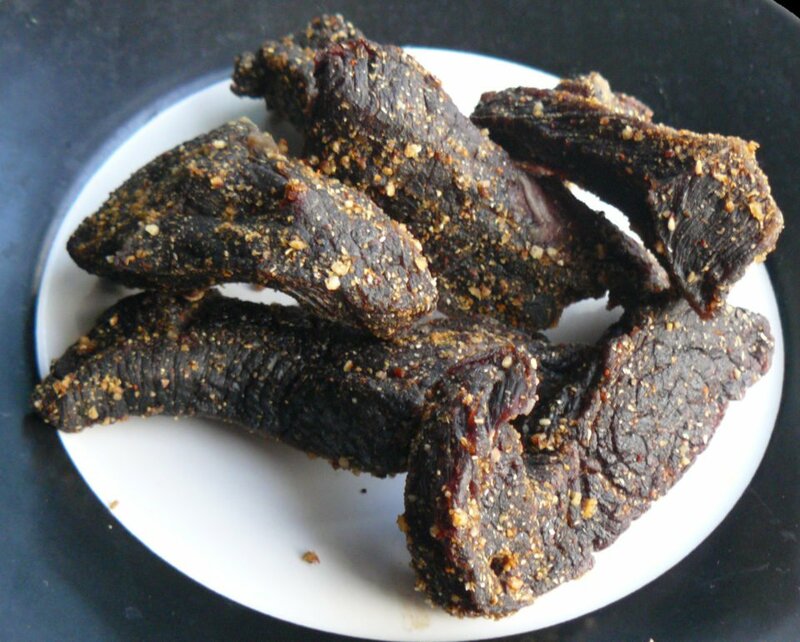 Biltong, dried cured meat, is the best snack food ever! I was very pleased to discover then that Botswana has a rich culinary heritage very different from any other African cuisine I’d ever tasted. Although I never got to try the infamous mopane worm (but it’s on my to-do list! ), I did enjoy eating seswaa (a boiled, shredded beef specific to Botswana), bogobe jwa lerotse (a sweetish polenta-like dish made from sorghum and lerotse cooking melon), and one of my favourites: madombi, a bread-like dumpling that was delicious with cornish hen cooked the Setswana way. If you ever find yourself in Botswana, be sure to venture into the exciting world of Setswana cuisine. I read in the Lonely Planet Botswana & Namibia travel guide that Botswana’s National Museum & Art Gallery could be enjoyed “if you come with expectations reasonably lowered”, so that’s what I did. My experience was not at all like that of the guidebook’s author though; I actually enjoyed the museum and almost had to be dragged out of it by my travel companions. Yes, it was dark (go with a torch or good flashlight on your phone) and not well attended (I didn’t see any museum staff for the hour plus that I was walking through the museum), but the displays are full of information and you can tell that a lot of thought went into designing them. If your main interest in visiting Botswana is seeing its wild side, e.g., going on safari, then this may not be the thing for you. If, on the other hand, you are interested in learning about Botswana, her people, their culture, and its natural history, then don’t skip this. The thing I most enjoyed learning about at the museum was the phenomenon of sip wells—a way Kalahari bushmen extract water from beneath the desert sands by sticking a straw into it and sucking out water. Talk about interesting indigenous knowledge! 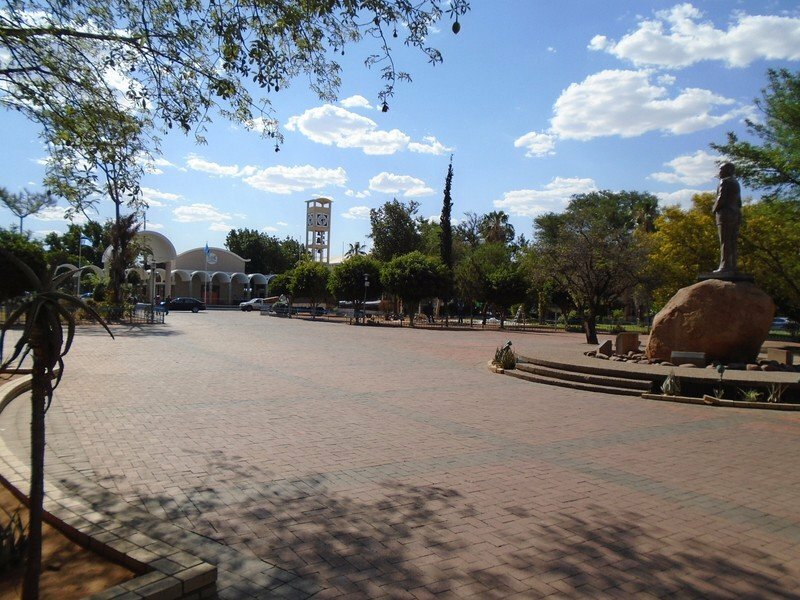 A short 3-minute walk from the National Museum & Art Gallery is Gaborone’s Main Mall. Not really a mall as you and I would understand it (think: more of a flea market), Main Mall is a pedestrian-only commercial area which was built 3 years before Botswana’s independence in preparation for that event (Gaborone is not a capital city that grew organically but one that was carefully selected and built from the ground up for the specific purpose of becoming the capital of Botswana). Main Mall is home to some of Gaborone’s oldest shops and office buildings, including one of the city’s first hotels, The President Hotel. Across the street, to the west of Main Mall, is Gaborone’s Government Enclave. There, you can find government offices, the National Assembly, a statue of Sir Seretse Khama, Botswana’s first president (yes, he was a knight! ), and a couple of war memorials. Whenever I visit a new African country, I make a point of visiting a market to check out the traditional crafts made in that country. In Gaborone, the place to visit is Botswanacraft, off the Western Bypass in Block 3. Originally started by the government in 1970, to develop Botswana’s rural based handicraft industry, Botswanacraft is now privately owned and is the country’s largest retailer and exporter of handicrafts from Botswana. Even if you don’t plan on buying anything, visit Botswanacraft just to feast your eyes on all the beautiful things there are to see there. 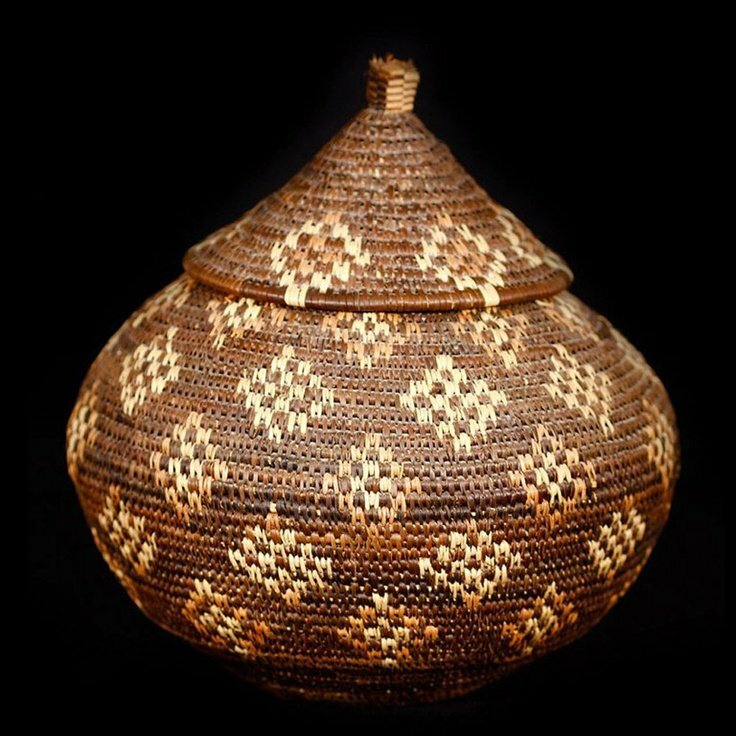 Botswana’s intricate brown baskets are not something you’ll easily forget once you’ve laid eyes on them. Don’t worry, though, there’s a lot more to see than just baskets. I also hear the Courtyard Restaurant, at Botswanacraft, serves a mean selection of local delicacies (see number 2 above )! If you are in the mood for a safari experience but don’t have the time or money to visit some of the country’s bigger, more popular nature reserves, then you are in luck because there are a few to choose from right in the capital of Botswana and nearby. On the advice of TripAdvisor, I chose to visit Mokolodi Nature Reserve, located only 10 km south of Gaborone, and was not disappointed. One of my travel companions though, who like me has visited her fair share of nature reserves in East Africa, felt that the low density of animals in this privately owned reserve was anticlimactic for her. I, on the other hand, enjoyed the two-hour game drive in an open safari vehicle taking in the scenery, which as expected was very different from what I’d seen in East Africa. Other highlights included seeing 1) a black giraffe, 2) a steenbok, and 3) a warthog with her young sheltering in a hole for the first time. I enjoyed it, but your mileage may vary depending on what wildlife you’ve seen before! 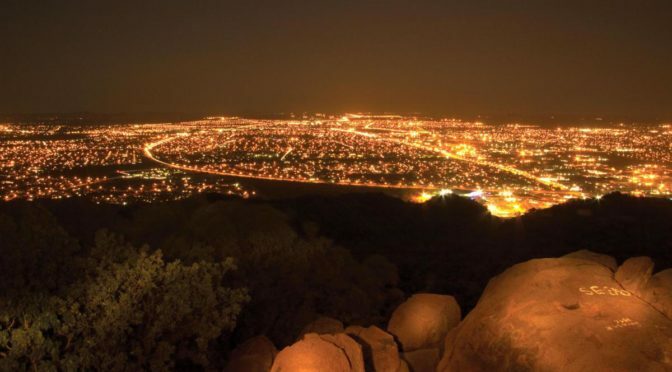 Gaborone is only 15 km from the South African border and crossing into South Africa can easily be done as a day trip. Even if you don’t do that, driving an hour or so out of the capital of Botswana will give you a chance to have an experience different from that of urban Gaborone. I chose to go on a trip in the northeasterly direction. On that day, my plan was to visit Oodi Weavers (which was not worth the time); see the Matsieng Footprints, an archaeological site run by the National Museum, which I found closed because I now know they close on Tuesdays and Wednesdays; and visit the village of Mochudi with its Phuthadikobo Museum, which remains one of the highlights of my trip to Botswana. Mochudi is a “village” (though it looked like any other African upcountry town to me) located 37 km northeast of the capital of Botswana. Mochudi is home to the Bakgatla, a subgroup of ethnic Batswana (as opposed to the generic use of the term to mean anyone from Botswana). The seat of the Kgatla chiefdom is located at the top of Phuthadikobo Hill in Mochudi. The Phuthadikobo Museum, located on this same hill in a building that once housed the first school in Botswana to offer secondary education, is a museum dedicated to the history and culture of the Bakgatla. The museum is well stocked and I was very impressed that it was manned by young modern Bakgatla women, some of whom were training to become museum docents in order to preserve their dying culture. 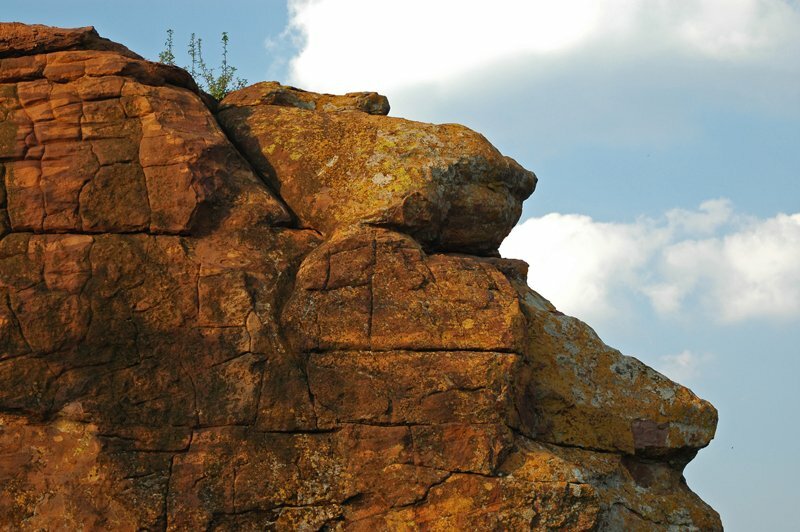 The boulders on Phuthadikobo Hill are gorgeous! Just as I like to eat like the locals whenever I travel, I like to drink like them too. When I heard about a local commercially-produced alcoholic beverage called Chibuku that’s similar to Botswana’s traditional homemade brew, I knew I had to try it. Chibuku Shake-Shake is also produced in 7 other African countries, but this was the first time I was encountering it. A sorghum beer, Chibuku contains only 3.5% alcohol by volume (so there’s nothing to worry about there), but it sure is an acquired taste. Because of the government’s crackdown on alcohol, you can only buy Chibuku at one of the brightly-colored depots around the country specific for this purpose. In Gaborone, whenever I asked locals what there was to see and do in the capital of Botswana, I got a lot of “maybe you’d like to visit some malls”. Hmmm…that’s not my idea of fun when I visit a new country, especially one that I know has a rich culture and amazing natural landscapes, so I purposely saved visiting malls for the end of my trip. Truth be told, though, Gaborone’s got some pretty gisty malls, with Game City Mall being the biggest and Airport Junction the newest. Shopping there was a real treat (especially coming from Tanzania) and prices were relatively affordable. To give you an idea of what Gaborone’s malls are like, here’s a video that shows a car driving through the capital of Botswana and making a stop at a few of its better malls. Some of my best dining experiences in Gaborone were at restaurants located at malls. I loved having seafood at Airport Junction’s Ocean Basket and sushi at Rhapsody’s. The variety of cuisines at Riverwalk Mall had me giddy with excitement and looking forward to the next time I get a chance to visit. When you are in the mood for some luxury, hop on over to The Grand Palm Hotel Casino & Convention Resort for drinks at the Kalahari Cocktail Bar (or by the pool at The Fig Tree), or have dinner at one of the posh restaurants in this complex. I enjoyed dining at the beautiful Bai Sheng, which serves Chinese food, but I hear The Beef Baron is pretty good too. Those are some of the things that I enjoyed doing while visiting the capital of Botswana a few of months ago. I hope some of these suggestions work for you if ever you are in Gaborone and are looking for what to do. If you know something great to do in or around Gaborone that I didn’t mention, please let me know by leaving me a comment below. P.S. If ever you are in Gaborone and are looking for a safe and reliable taxi, I highly recommend Amu Moeti (Tel: +267-73-418710) who was both my cabbie and informal tour guide the whole time I was in Gaborone. Amu is friendly, reliable, available around the clock, and has good rates too! P.P.S. Enjoyed this post? If so, subscribe using the form below to be sure not to miss any future posts from me. Also, please share this post with friends and followers on social media—I’d greatly appreciate it! Wow. This is phenomenal. I can’t wait to go see! I am from Molepolole, which is about 40 mins north west of Gaborone. 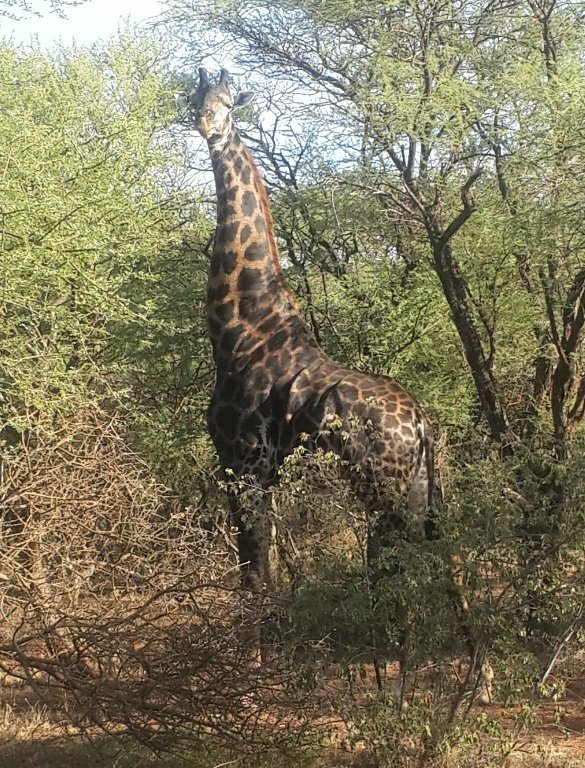 One other cool place Lion’s Park, just 15 mins out of the city on the A1 highway to Lobatse. It’s an amusement park with a rollercoaster and many other fun things to do. Welcome to ChickAboutTown! Thanks for adding to my list of things to do in Gaborone. I heard of Lion’s Park when I was in Gaborone, and everyone told me how close it was to the city, but having seen Lions in the wild (think the Serengeti/Ngorgongoro in Tanzania), I was worried it’d be too touristy rather than an interesting animal experience. I hadn’t realized that it was also an amusement park. Thanks for letting me know. It’s now officially on my list of things to do the next time I am in Gaborone. ???? Hi. This is totally great. Thanks for profiling my city. I’m a Motswana, living in Dar es salaam for the next 3 months. 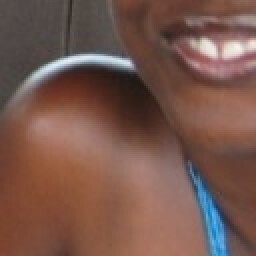 I’m also a blogger at nolsynols.com (not as advanced as yours though), would like to hook up sometime if you don’t mind. It is a pleasure to profile your city. I truly enjoyed my stay in Gaborone: I learned so much! It would be my pleasure to meet up with you some time. Let me send you an email so we can organize that!